I’ve always been dreaming to go to all those “legendary” places that I´ve marked in my Tibetan world. Over time, it was indeed possible to visit many of them such as the remnants of the palace in Guge or the fabled Mili kingdom of old. But this summer, Tibet was beyond my wildest dreams. Everything started out normally with us planning to visit our relatives and friends. We weren’t sure until the last minute whether we would get to spend our summer family vacation in Tibet at all. Entering the country was the usual gamble with flight tickets all purchased but no visa in sight until the final hour. In the end, the god of good fortune was in charity with us: We were free to go. With Lhasa closed until the end of July due to the “60 years autonomy” anniversary and security forces watching over parts of Eastern Tibet due to renewed protests, there wasn’t much choice with regard to where to go. 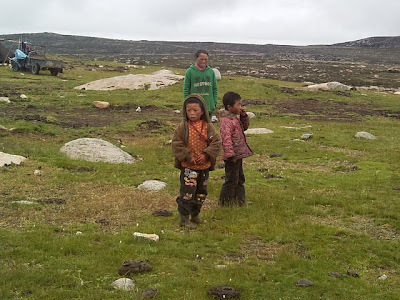 Panda-watching in Ngapa County would have been lovely for the kids - especially with “Kungfu Panda - Part ll” being out this summer – but Ngapa, too, was in the heat with dissent and simply risky with children. 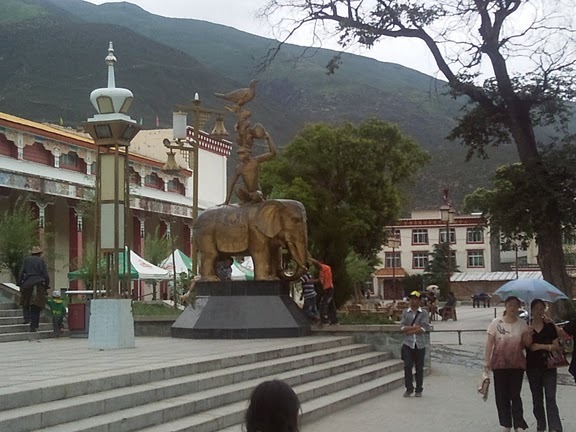 So this time our little family travelled overland across the southeastern section of the Tibetan plateau with Bathang and Lithang, two historical trading towns, among the highlights. Immortalised by Dalai Lama number six in the folk song “White Crane”, Lithang was a place I really longed to see. It also looked very doable with children since the roads were in excellent condition. And although Lithang is another Tibetan area with “secessionist tendencies”, we were assured it was open. Lithang produced outstanding religious and secular leaders such as the 7th Dalai Lama, Gyalwa Kelsang Gyatso, and the founder of the Tibetan resistance, Andrug Gonpo Tashi. It had special meaning in Tibetan national memory. I was so excited about the prospect, I kept singing the line from “White Crane” in the car, all the way to Lithang Dzong with a faux, exaggerated eastern accent: Tharong jong-la mendro, Lethong kooné lewong yeah! – “I’m not going far, only up to Lithang, from there I shall return”. After we finally made it to Lithang, I couldn’t fall asleep at night. Maybe it was altitude insomnia, I had that once before. Or maybe it was simply my hyper-excitement about finally being in Lithang: Too drunk from the grandiose visual feast of driving across the alpine grasslands. I never saw a more majestic plain than the one about an hour’s drive to the west from the County seat or Dzong, which the locals call Bonyokthong. Or maybe plain and profane, I simply couldn’t sleep because of the noisy room at this awful hotel, Shen Di (“Sacred Earth”)? With 260 RMB per night, it was by far also the most expensive hotel we stayed at. It was located in the middle of an intersection and almost falling apart. When I closed my eyes, I had the impression my bed was right in the street below on a pedestrian crossing with the traffic lights switching from red to green throughout the entire night although no pedestrians or cars were in sight. Lithang was breathtakingly beautiful and often seemed untouched by modern civilization. A historic place for the Tibetans, and there we were standing in the middle of it all, breathing the pristine mountain air and gazing upon endless wide pastures. 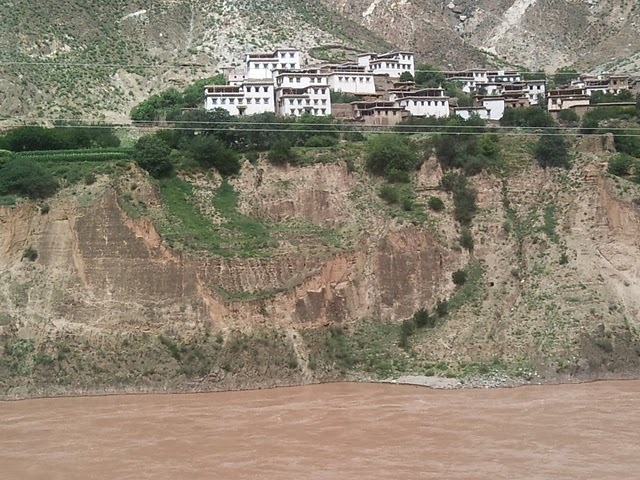 The Dzong, on the other hand, was depressing. It looked scruffy. There were a lot of metal workshops and a few Chupa shops along the streets as well as the usual Sichuanese restaurants. The whole town was explored in about an hour on foot. Often you would find a Xinhua bookshop with maps and some books about the local history in a County seat, but Lithang didn’t have one or it was closed down. There was nothing much going on in the Dzong it seemed. Yet all these young men standing around on the sidewalks in the middle of the day with broad rimmed glasses, some hooting around on colourful motor cycles with speakers - didn’t they have jobs? Or was there something going on, we didn’t know? On the main street it all seemed like something imminent was going to happen. We didn’t dare take photos. People somehow looked wary. Police monitored the little town from small booths erected every twenty meters or so along the street. Police cars patrolled up and down. From my hotel room with huge windows and a lot of draft, I saw a small group of Western backpackers being quickly dispersed as they started a conversation with locals. It all looked surreal. Was this daily life or was this exceptional? 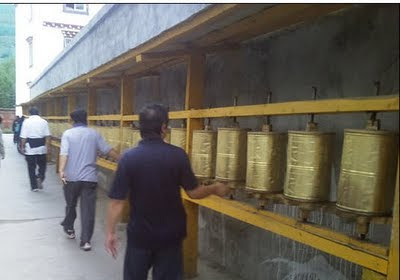 We hesitated to visit Lithang Gonchen close by. The atmosphere in town just seemed too tense. It was a shame. How can one come all the way here without paying respect to this famous monastery? We already missed the annual horse race which everyone said would begin as usual on 1 August. It should have been the first official festival held since 2008. But instead of the normal multiple-day festivities with the real party only getting started on the second day, it was a crippled version cut down to a single day – with us unfortunately arriving too late. But things looked better the next day and we could visit the grand Lithang monastery after all. I was very happy. There was a lot of construction work going on at the monastery and many of chapels were not open. The international Buddhist flag was fluttering from the roof tops. An official announcement at the gate said there was an interregional religious gathering taking place. Was this the reason for the conspicuous police presence in town? We managed to go for Chonje in the assembly hall. Although the dominant image was a gigantic statue of Je Tsongkhapa, we almost overshot it due to the many photos of the current Dalai Lama. You wouldn’t believe! And not just tiny photos hidden away, but large, poster-size portraits in full display, many of them taken around the time when he was awarded the Nobel Peace Prize. Every other meter there was a shrine with His Holiness’ picture. Was his picture not illegal here? Or did the monastery simply defy official orders? And why so many pictures? It sure looked a bit obsessive to me. Afterwards, the monk-on-duty gave us holy water and Jendu. Then he asked about our Phayul or where we were from. Among Tibetans living abroad, asking this question is considered politically incorrect by some. You are not supposed to think of your Phayul, you are supposed to think big. Every Tibetan kindly had to have only one Phayul and its name was “Tibet”. Digging deeper was unsolicited. On the ground in Tibet however, it’s perfectly natural to ask people where they’re from since it is self-understood that every Tibetan in Tibet is also automatically from Tibet. And since speaking Lhasan or high Tibetan, as it is a practice among the Tibetans abroad, is not the norm here, where one is usually betrayed by one’s native accent anyway, holding back information about one’s Phayul could come across as weird. We would have liked to interact more with people, especially the nomadic Lithangpas whom we met along our driving journey. We could often see their camps from the road. To help start a conversation, we would offer biscuits and noodles as a friendly gesture. 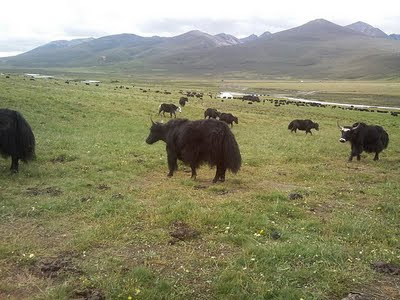 Sometimes they would invite us into their Banak or black tent made of yak hair and serve fresh milk. An unexpected problem was language. Heaven knows how Tibetan nomadic speech or Drogkay works. It sounds like Mongolian or something. They spoke differently from the Lithangpas in the Dzong whose Tibetan we could slowly follow. 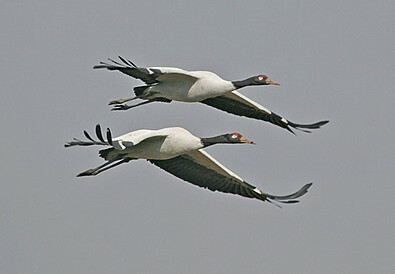 A friend said even he as a semi-nomadic Samadrog Lithangpa doesn’t understand them. Isn’t that strange? He said the Lithang nomads spoke the same language as the nomads in Amdo. As picturesque life in the grasslands appeared to me, to tell you the truth, it would be very hard if I had to live here. I wasn’t keen at all on going into those tents. 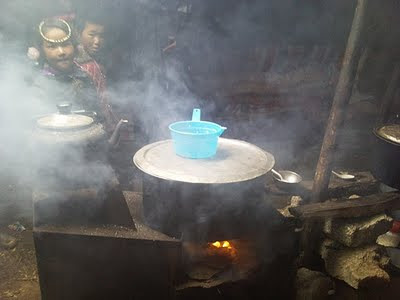 I’m probably getting old and fuzzy, but I can’t stand the smell of the smoke – whether from a wooden fire or a dried yak dung fire – all your clothes smell sour from it and perspire for the longest time. Their children often don’t go to school. The wind blows incessantly and it is cold even in the summer - virtually no child without a runny nose. Everyone sleeps, eats and prays in the same tent. Honestly, having to live like a Lithang Drogmo would be like being condemned to hard labour in Siberia. If the Chinese offered me one of those new row houses along the roads built to resettle nomads into communal life, Buddha forbid, I would probably go for it. Lithang was breathtakingly beautiful. But it also came across as raw and archaic. The nomadic way of life is authentically Tibetan, no doubt. It’s the archetypical Tibetan way of life. If there is one thing we long for it’s the freedom and the simplicity of nomadic life. But does it hold a future for the people? Their whole world revolved around their animals.The people we saw in the streets of the Dzong looked out of place. In Lithang you could see how the Chinese and the Tibetan worlds clash. The Chinese have no idea how to bring these people into the mainstream other than by using repression and violence. The Tibetans don't know how to make themselves heard other than by taking to the streets. They looked like extreme opposites with no common ground. He also said people in Lithang felt insecure when having to deal with Chinese people. Bathang people, in contrast, knew no inhibition. Were these the general differences between nomadic, high-altitude Lithang and agricultural, low-altitude Bathang? 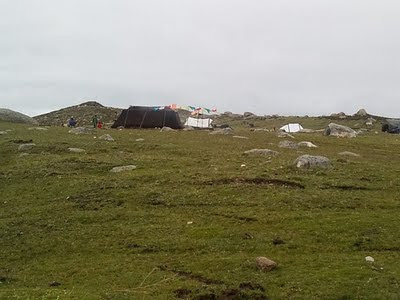 Did the Bapas really have an advantage because they had been brought into contact with the Chinese earlier than most other Tibetans in this area? Were the nomads of Lithang really too limited in their worldview, not flexible enough? Or was this the statement of a prejudiced, self-enamoured person from Bathang? I wasn’t at all interested in going to Ba or Bathang. If the other counties further north of the Kardze Prefecture had been open, we wouldn't have gone to Bathang, that's for sure. A place like Dege was worth visiting. It had culture, handicraft, local architecture, and the famous printing press. But backcountry like Bathang? Please! From Bapa Phuntsog Wangyal’s autobiography written by Melvin Goldstein and books like “Khams pa Histories - Visions of People, Place and Authority”, I imagined it to be a very Chinese town with lots of sinicised Tibetans and nothing interesting to see. Well below 3000 meters altitude, it was also lower than most other places: I bet elsewhere in Tibet, you won't see many men and women walking down the street in sandals with nylon ankle socks on. Just how hip is that? But I must say Bathang was a positive surprise in other aspects. In terms of architecture, the rural area outside the Dzong was as Tibetan as in any other place we had visited before. It was interesting to observe that every region had its own particular building-style. The farm houses near the Dzong were brown rammed-earth buildings with flat-roofs and colourful window frames. Further south along the Drichu, houses were painted white. The first thing we noticed when we entered the Dzong was how relaxed people were, and how friendly the police could be. We stopped by the road to look for a hotel. When I saw the police approaching, I immediately felt uneasy. When we were only one day’s journey away from Lithang, a police car with four police officers inside blocked our passage at the intersection in Sumdo Township. They refused to let us continue claiming Lithang was closed although everyone else including the United Front people had said southern Kham was open. It smelled like corruption and police arbitrariness all over the place, but what to do? My partner kept assuring me they would let us through. It would just take some negotiation. I should keep cool. It was one of those unpleasant situations you encounter in Tibet. But luckily someone in our group knew somebody higher up in the local government whom he called up on his cell phone, who then rang up that nasty police officer in charge. After three nerve-wrecking hours in the middle of the intersection we could finally continue. So when those Bapa police officers came over to our car, I expected the worst – like being made to leave the city at once. But then they only said we were not allowed to park there. When we told them we only needed five minutes to check out rooms at a nearby hotel, they said we could get the best rooms in Bathang at the Garden Hotel for 180 RMB per night. Wow, what great service and tourist information from the Gong An! And reliable at that because we did get great rooms with functioning toilet and a bathroom with plenty of running hot water! The town was in a valley about the same size as the Dzong in Lithang, but it had more inhabitants. We hardly saw any tourists, Chinese or Western. 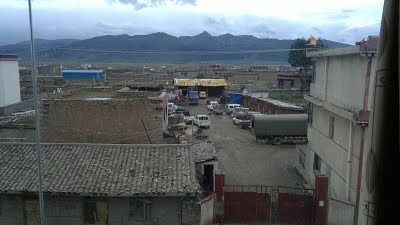 Bathang looked like a sleepy, provincial town. We were told all local cab drivers were Tibetan – in other Tibetan towns they were often mostly Chinese. Apparently, the local traffic bureau gives away cab driver licenses only to Tibetans telling Chinese candidates that their application is incomplete. The vendors in the local vegetable market looked Tibetan too. Usually, the local market is Chinese turf. Where were all the Chinese you’d always find in a Tibetan County seat? Where were all the descendants of those Chinese who were settled in Bathang by Zhao Erfeng, the butcher? 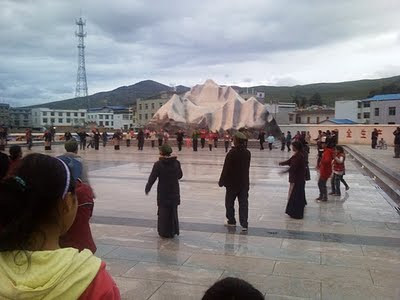 People didn’t wear Chupa like in Lithang, yet the cityscape somehow still appeared Tibetan. In Lithang and other places the government building is usually cordoned off by a wall and a gate. In Bathang, however, it was completely exposed with the stairs to the building being used as part of a public square where people would gather in the warm evening sun after a day’s work. For Tibetan standards, the place looked prosperous. Agriculture was the main sector as in most Tibetan areas but with the lower elevation, harvest was better. I also realised Bapas are better educated than your average Khampa. 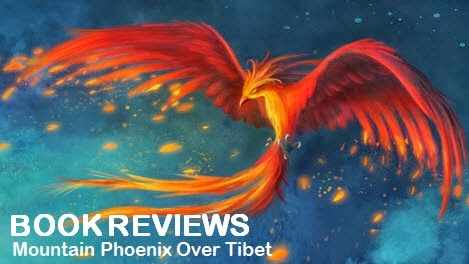 Not only are they on par with the Chinese regarding education and training, but they also managed to preserve their Tibetan identity in the pursuit. Many are proficient in Tibetan. They may not be up to the Amdowas, who seem unrivalled in this field, but among the people of Kham, Bapas are probably among the top, working in fields such as journalism and academia. Not surprisingly we learned that the head of Kham TV, a new television channel broadcasting to the Tibetans in Sichuan and Yunnan, hailed from Bathang. We also learned that there haven’t been any protests in Bathang. Could it be that there was a correlation between open political protest and poverty? Could it be that Tibetan areas that did economically better such as Bathang were likelier not to have protests? Another place in eastern Tibet that hasn’t seen open protest is the Dechen Prefecture in Yunnan, which also does comparatively well mainly thanks to tourism. And does refraining from open protest mean people are happy under the Chinese? A Bapa friend said Bathang folks are too smart to openly protest against the Chinese. Open protest meant risking to lose all the smaller and bigger freedoms they have acquired over the years. They may not be fond of Chinese overlordship but pragmatic enough to realise that a bird in the hand is worth two in the bush. When you think about it: What could the Tibetan leadership in India do for them? Would you risk your job and lifestyle over a beautiful dream, Tibetan self-rule? Maybe Dharamsala has to work harder to convince Tibetans like the Bapas that it would really be able to provide a political alternative? Then there was the monastery. 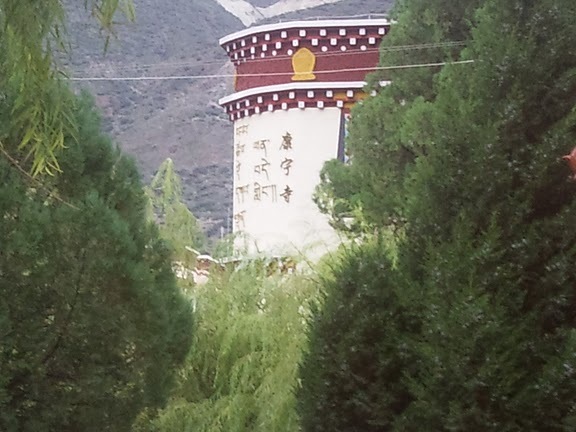 Many monasteries in this part of Tibet have impressive-sounding names just like Bathang Chode Gon Ganden Phendeling. But they didn’t impress me: Many simply looked splendid on the outside but were void of content; monks were part-time monks, part -time nomads and family people, chopping wood, trading, picking mushrooms and so on and so forth. With many of the senior teachers and great masters either deceased or expatriated, it was also difficult to ensure the quality of the Buddhist teaching. And the closer a monastery was to a town the likelier the monks would be distracted - Bathang monastery was right in the middle of town. Boy was I wrong about Bathang monastery! It is a jewel with no equal in that area. 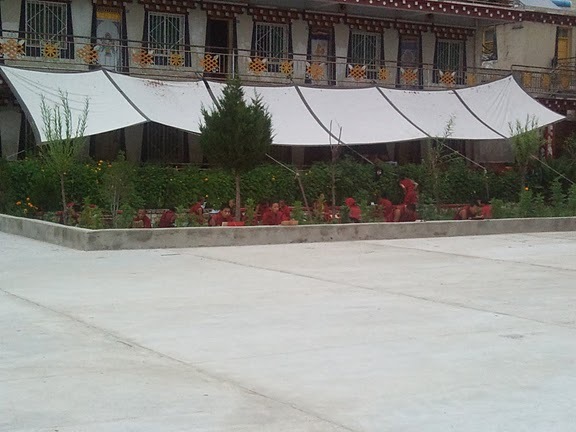 When we entered the courtyard, we heard loud voices of young novices chanting and studying Buddhist texts. There must have been over several dozen if not one hundred. I felt transported to a Tibetan monastery in India. Finally a monastery that was not only a splendid building but that was alive! Then we went to pay our respects. Accompanied by a monk we were allowed to enter a few smaller chapels on the second floor which they opened specifically for us. Even here they had pictures of His Holiness. Not nearly as extravagant as in Lithang, but they did have them and they did display them openly. When it was time to leave, the monks invited us for tea into the monastery kitchen. 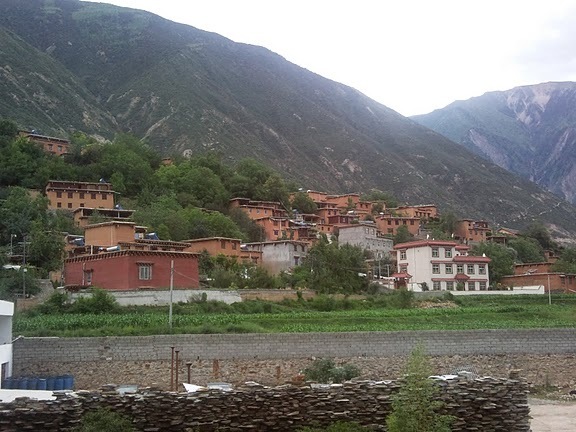 Bathang had a vibrant monastic community. We heard it was due to the influence of some monks who returned from India. 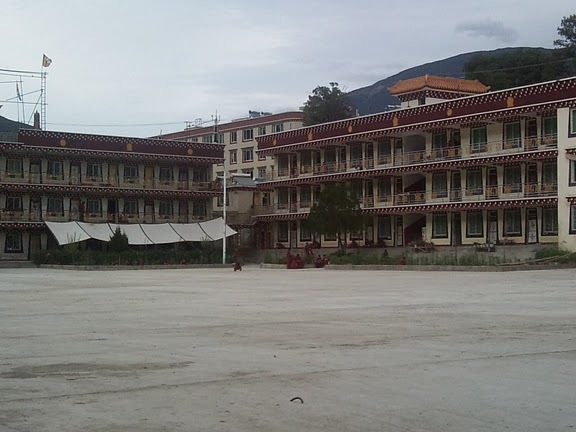 That explained the similarity: Bathang monastery looked like a “monastic college” in Southern India with dormitory-style housing where four monk-students shared one room. The international Buddhist flag was also fluttering from the roofs. After we left the monastery to go for circumambulation, we saw that the place also had a practicing lay community going for Kora and doing Mani. There were old folks in Tibetan clothes, youngsters in Western attire, and people that looked like they worked in some government office. Everyone seemed to be there in the evenings. It felt almost like Boudhnath, Nepal. I was surprised Bathang didn’t have a square for public dancing. Most Dzongs had such a square which was lively used. After all, this was Bathang, the place that gave the popular folk music genre Bashè its very name. But my partner jokingly replied, people here don’t need to go for dances in the evenings because they have better things to do: They practice Dharma! Yes, Bathang was a pleasant surprise and I was glad after all we didn’t skip it on our journey. A friend told us, the future would not be so good for Bathang since there were plans to build several hydropower stations, as well as a cement factory. 15,000 Chinese would be moved to Bathang, she said. Terrible prospect! But if anyone can somehow handle this renewed assault on Tibetan identity, it should be the Bapas. To an accidental external observer, they have done a pretty good job to maintain their Tibetan identity all the while integrating into the Chinese mainstream, obtaining a modern education and running their County well. I can only hope they will be able to cope with the new challenges ahead. It was nearly five o’clock in the morning by now. Still no trace of sleep. I decided to get up and prepare myself a cup of instant Nestlé “Red Cup” coffee. Before long, the kids would be awake. It was always better to be one step ahead of them. I was wondering if you had a readable photo of the Tibetan notice about language. I would very much like to read the text. I will send the original size to your email address. I do hope you will be able to decipher it. We would look forward to seeing a translation! Demo Demo. Nice panorama photos.Can you say a little more about the Milli kingdom....never heard of it. The articles Joseph Rock wrote for the National Geographic in the 1920s and -30s are worth reading to learn about the history of the place. FYI: The name really is Mili and not Muli, which is a Chinese corruption (mu = Chinese for wood; the place has tons of timber with whole mountains covered with huge trees). Not many Tibetans may know about the place since it was the edge of the Tibetan world ruled independently by a Lama-king, the Mili Kyabgön. Some may have heard of the late Geshe Yeshi Wangchuk, who was put in charge of the Norbulingkha by the Chinese. I heard he was a Miliwa. Too bad the photo of the letter is too small to read! To add some value after all, I asked a monk to give it a shot. He couldn’t read the whole thing either but from the passages he could read, he said, it’s an “appeal to keep your father tongue clean” beginning with spun zla tsho! khyed kyis rang nyid mi rigs gson po zhig byed ’dod dam? khyed kyis … mi rigs ’di la byas rjes rlabs chen zhig ’jog ’dod dam…. It seems people are strongly encouraged to speak “pure Tibetan” within the walls of the monastery - since mixing in foreign loanwords is pretty common. 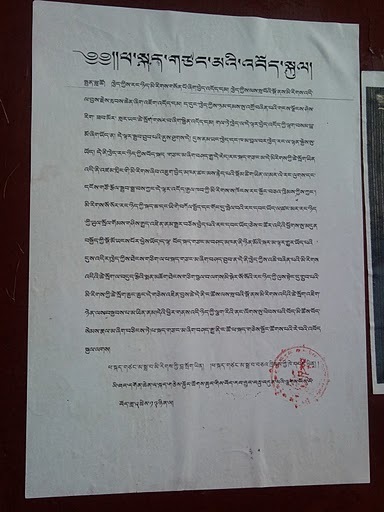 The undersigned is li thang dgon chen na skad gces skyongs… - some kind of “language saving society” of the Lithang monastery, dated 13th day of the 5th month. This initiative to preserve purity of language is obviously commendable and has profound implications for resetting people's political mindscape, but the limitations of taking it too literally should also be recognized if we are not to reduce our scope of dialog on a wide variety of issues and topics. Even the language police in France have a hard time getting the French to stop saying 'weekend' and a host of other words and phrases. And in India for example, both Hindi and English language media are liberally peppered with words and even sentences, from the other language. To my mind, a degree of appropriation of other language, is not necessarily that evil, especially if aids communication functions for the individuals engaged in the conversation. But at the same time, I recognize the importance of Tibetans being able to carry on a comfortable conversation with as rich a vocabulary as possible in unadulterated Tibetan. In other words, we should have the facility to speak in good Tibetan as well as the option to talk in Tiblish, Tibdarin, Tibhindi or Tibswahili. Helloooo ....it's September 30......where's the post for the month? Hi MP, not sure if this is still relevant but if people still want a translation of the letter "A Call for A Pure Tibetan", I can provide one. Let me know. Will check back.